A couple weeks ago, my friend Stephanie (aka Iron Stef) helped me make David Chang's roasted pork belly & Chinese steamed buns. The recipe comes from his new cookbook Momofuku, named after his acclaimed New York noodle bar (which was named after the guy who invented instant ramen). Chang's book received attention when it was released in October not only because of the recipes and gorgeous color photos but also because of his narrative voice. In the introduction to each section, Chang "relays with candor the tale of his unwitting rise to superstardom, which, though wracked with mishaps, happened at light speed." And he curses. A lot. in other words, having read only the intro, ready to declare Momofuku cookbook of the year. certainly the most entertaining. The book does make for a good read. In fact, I read it cover-to-cover like a novel. Even the recipes themselves are entertaining reading. For example, in his steamed buns recipe he writes: "Cover the armada of little dough balls with a draping of plastic wrap and allow them to rest and rise for 30 minutes." Good stuff. Warning: This cookbook is written for serious cooks. Chang even admits that some recipes aren't meant for home cooks. Other recipes, like his infamous pork belly buns, are fairly easy; they just require many time-consuming steps. But in the case of the pork belly buns, the time is totally worth it. Heat the oven to 450ºF. Turn the oven temperature down to 250ºF and cook for another 1 hour to 1 hour 15 minutes, until the belly is tender—it shouldn’t be falling apart, but it should have a down pillow–like yield to a ﬁrm ﬁnger poke. Remove the pan from the oven and transfer the belly to a plate. Decant the fat and the meat juices from the pan and reserve (see the headnote). Allow the belly to cool slightly. Cut the pork belly into 1⁄2-inch-thick slices that are about 2 inches long. Warm them for serving in a pan over medium heat, just for a minute or two, until they are jiggly soft and heated through. Use at once. clear out a couple of hours and some space in the freezer and get to work. Combine the yeast and water in the bowl of a stand mixer outﬁtted with the dough hook. Add the ﬂour, sugar, milk powder, salt, baking powder, baking soda, and fat and mix on the lowest speed possible, just above a stir, for 8 to 10 minutes. The dough should gather together into a neat, not-too-tacky ball on the hook. When it does, lightly oil a medium mixing bowl, put the dough in it, and cover the bowl with a dry kitchen towel. Put it in a turned-off oven with a pilot light or other warmish place and let rise until the dough doubles in bulk, about 1 hour 15 minutes. Meanwhile, cut out ﬁfty 4-inch squares of parchment paper. Coat a chopstick with whatever fat you’re working with. Flatten one ball with the palm of your hand, then use a rolling pin to roll it out into a 4-inch-long oval. Lay the greased chopstick across the middle of the oval and fold the oval over onto itself to form the bun shape. 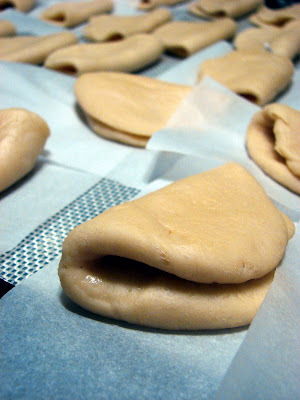 Withdraw the chopstick, leaving the bun folded, and put the bun on a square of parchment paper. Stick it back under the plastic wrap (or a dry kitchen towel) and form the rest of the buns. Let the buns rest for 30 to 45 minutes: they will rise a little. Set up a steamer on the stove. Working in batches so you don’t crowd the steamer, steam the buns on the parchment squares for 10 minutes. Remove the parchment. You can use the buns immediately (reheat them for a minute or so in the steamer if necessary) or allow to cool completely, then seal in plastic freezer bags and freeze for up to a few months. Reheat frozen buns in a stovetop steamer for 2 to 3 minutes, until puffy, soft, and warmed all the way through. 2 meaty Kirby cucumbers, cut into 1⁄8-inch-thick disks. Combine the cucumbers with the sugar and salt in a small mixing bowl and toss to coat with the sugar and salt. Let sit for 5 to 10 minutes. Taste: if the pickles are too sweet or too salty, put them into a colander, rinse off the seasoning, and dry in a kitchen towel. Taste again and add more sugar or salt as needed. Serve after 5 to 10 minutes, or refrigerate for up to 4 hours. TO ASSEMBLE THE BUNS: Slather each bun with hoisin sauce. 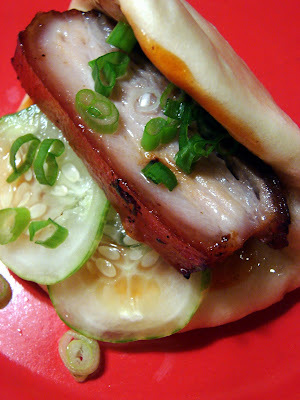 Then place a slice of pork belly, a couple pickles, & a sprinkling of sliced scallions inside the buns. Eat & be amazed that you made such a tasty dish. The next morning, take some buns from the freezer, steam them for just a couple minutes to reheat, then stuff each with scallion scrambled eggs & leftover pork belly that you've reheated in a skillet. Dress with hoisin sauce (or hot sauce if you're feeling frisky) for a breakfast of champions. Thanks to Steph for taking the photos! Wow, I'm a little jealous - I can't wait to make and taste! I got the pork belly at Global Foods.